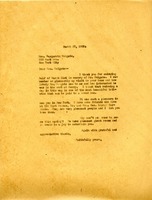 Letter to Margareta Colgate from Martha Berry thanking her for endowing half a day in honor of Mr. Colgate. Miss Berry recalls how pleasant he was to her on her visit to them in New York and how interested he was in the work at Berry. She also mentions that she has friends on Park Ave. that she wished Mrs. Colgate knew. She also asks Mrs. Colgate to come and visit her in Georgia.